The NRCHA Derby Intermediate Open Champion, Cats Smart Oak (WR This Cats Smart x Cookie Q Lena x Quanah O Lena), is owner Polly Potocar’s Non-Pro Limited Derby horse,. The 5-year-old gelding was entered in the Derby Open with Potocar’s trainer, Mark Luis, to school so he would perform better for Polly. But the schooling run became much more when Luis qualified Cats Smart Oak for the Derby Intermediate Open finals – and then won the Championship with a total 660 score. The Intermediate Championship came with a check for $6,424, a Gist buckle from NRCHA; a set of quick wraps from Back On Track; and a Platinum Performance gift certificate. Derby Intermediate Open Champion, Cats Smart Oak, shown by Mark Luis. Potocar and her sister, Linda Wood, are both clients of Luis’s, and have been enthusiastic competitors in the NRCHA’s Non-Pro Limited Derby division since it was first offered two years ago. The sisters keep their horses at Luis’s Paso Robles, Calif., training facility full time, and while Luis rides Cats Smart Oak regularly to keep him in shape for Potocar, he rarely works the gelding down the fence. 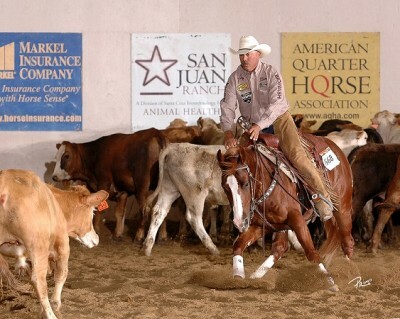 Potocar is offering Cats Smart Oak for sale, in order to bring up another young horse for the brand-new NRCHA Non-Pro Limited Futurity divison, which debuts at the Snaffle Bit Futurity in Reno this fall. Both she and Wood are excited about showing in three-event competition without the demands of fence work. “They really enjoy the Derbies, and they’ve already bought two 3-year-olds for the Non-Pro Limited Futurity,” Luis said.